Elderly people often prefer to stay in their own homes for as long as they possibly can, rather than move to a residential setting with full time nursing care. Many enjoy the independence of living at home and are able to benefit from visiting carers and nurses. They keep an eye on the elderly person by going in every day to help them with everyday tasks including personal care (like getting washed and dressed) and other tasks around the home with which they may require assistance like preparing food and doing housework. Elderly people are especially vulnerable and may be frail, and can find it difficult to answer the door themselves. Many are worried about their security and would quite rightly be concerned about allowing anyone into their home in case they are subject to an attack. What Is An Outdoor Key Box Used For? Outdoor key boxes are an ideal solution for providing authorised access to the property of an elderly person. Family members and friends can be given a simple four digit code to remember so that they can gain access to the key safe, allowing them to enter the property without having their own set of keys to worry about. The code can also be given to authorised carers and nurses who visit regularly so that they do not need their own keys. This is much safer than hiding a key somewhere around the property, which puts homes at risk of burglary from thieves who may spend time watching to see where hidden keys are located. Those who have been given the key code to a property can access the keys from a key safe located on the exterior of the building, meaning they can enter the property easily and quickly in case of an emergency. External key safes are also ideal for allowing access to the emergency services should access be required in the event that a person has fallen or injured himself or herself or is unwell and unable to answer the door. The code can easily be related to paramedics or ambulance service staff over the phone, saving valuable time in accessing the home. In times of emergency every second can count and having a key safe could even make a difference when it comes to saving a person’s life. Outdoor key boxes are usually made from a robust metal construction. They come with a weatherproof keypad cover designed to withstand all kinds of weather. Fixed in a discreet location, they blend in neatly with their surroundings. There are many different designs on the market that vary in price according to how many keys they hold and the complexity of the locking mechanism. The code can be changed as often as is desired and is simple and quick to change. 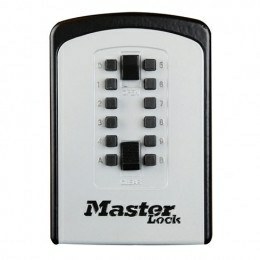 While digital key boxes are popular, there are also mechanical versions available that can protect against the eventuality of the key safe failing to open due to low battery power. Why Would We Need a Key Deposit Box?